Easter candies, digital coupon deals, Easter baskets, buckets, a lot of snacks, beverage, and similar stuff to celebrate. All will be on sale. 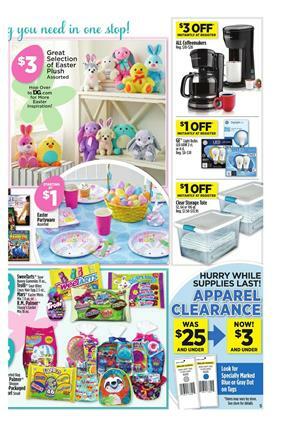 Dollar General Weekly Ad Easter Apr 14 - 20, 2019 is currently browsable. You can save on regular grocery items, too. Check out the first page for General Mills and more breakfast foods. They will cost 3/$6 only. Also, Maxwell House coffee is gonna be $1 cheaper with the $1 digital coupon. Instantly save $3 on household supplies. You have also deals on beverage products. Shop Fanta, Sprite, Coca-Cola, and more. Practical party foods like packaged-pizza and candies like Twix or Snickers are available in the range of Dollar General Ad. Easter savings are also profitable deals of the baking supplies. You can make great desserts and sweet foods with these items. Shop for these items on pg 3. Fill your Easter basket on pg 8. Amazing toys, cute gifts, confectionery, and many more things are on that page. Also, find apparel clearance. You can spot an Easter deal on all aisles of Dollar General this week. Like this one, all other weekly ads have something related to the Easter products. You can focus on saving more on your general grocery products.